Please contact owner Mike at 225-290-three nine four six. Boat is located in Springfield, Louisiana. Yacht is 50 ft long,2 Lectra-sans ,no holding tank.Robertson AP-45 auto-pilot.Port engine has 2062 hrs,Starboard has 2095,gen has 2855.New 12v water pump,new gen battery,new GE dorm fridge in upper salon,New engine zincs. 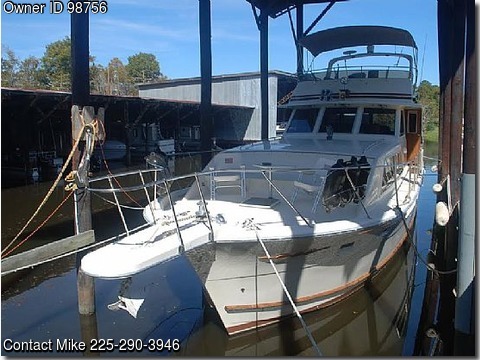 Would make an excellent second or liveaboard.Huge flybridge,New LED running and anchor lites.All coast guard equipment.Exterior wood is in good shape.New anchor chain stopper.New wireless remote for windlass.New bimini.Two new padded chairs and cocktail table at bow.All deck lites are LED.New 3 bank smart battery charger.Cable-master on both sides with 50ft 50A power cords.New backup camera.Fiberglass is in great shape needs waxing again.All glass is as should be.Lots of storage.600 gal fuel and 55 gallons of water.New carbon water filter.New powered TV antenna.Newer 20 gallon water heater. Engine sync.5 bilge pumps one high water alarm.5 heat pumps all work as should .8 ft wooden rowboat dingy.New Rockford stereo in lower helm and flybridge.New smoke alarms and co2 alarms.Overall a great yacht.Needs very little.Galley has a Miele glass elect cooktop,convection oven and dishwasher .Double door fridge with pass through ice.